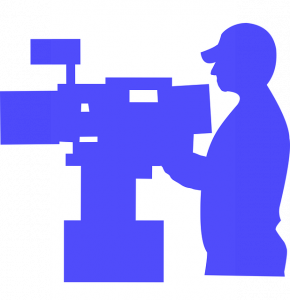 The fill-in checklist is a reasonable basis for planning your video production. You will find these in the menu item ” Checklist” in the information center. The first orientation is to clarify whether an image video, a product video, an event video or an educational film is needed. Further fundamental aspects, such as the character of the video production and film length as well as the question of costs and budget are topics for the first joint consultation or clarify directly afterward. The selection of music, moderation, effects, possible actors and the determination of the locations, the original language as well as any other languages belong to the detailed planning. All variables depend on the target group and the planned areas of application of the film production. With proper planning, the processes run at the lowest cost. We support you in the preparation of your video production according to your needs. An essential basis for the video production is the script, the film action in text form. Included are the ideas of how your messages are implemented. Formulated images, texts or dialogues in a series of scenes create a story. We Design This Crucial Script In Close Collaboration With You. High-quality film production is created when filming, lighting, technology, camera work, and sound are optimally coordinated. The locations and dates are correlated with your processes. In general, we use special leadership techniques such as Slider, Steadycam, Dolly or camera crane, provide optimal illumination for the right lighting and the right technology for appropriate sound ….. synonymous for live recordings. An experienced and well-rehearsed crew on the set is crucial for the efficient recording of video sequences in the best quality. Filming is done in full HD or 4K format. Expressive effects and unusual perspectives are possible through aerial photography with our multicopters, video sequences in slow motion and time lapse. After the filming, the digital postprocessing takes place on the produced video material. The rough cut determines a first selection and sequence of the footage. After the rough cut, in brilliant cut, the individual scenes are aligned to optimal image capture and optionally backed up with text fields. With editing and color corrections, the film is optimized. Also, visual effects/animations in 2D or 3D can be created and integrated. Scheduled moderation will be discussed in parallel by professional off-speakers. For synchronization in other languages, we use our network of native speakers or cast your favorite speaker. After your release of the final video production, the film will be converted to the appropriate data formats for the defined areas of use. The general digital media we provide you with the agreed usage rights.